A new FREE HUG music video has just been released. The song "12 Billion Arms" by nature airliner was written and arranged especially for the FREE HUG campaign. that exists in every one of us, in all life, and in all things. A very SPECIAL video about my trip to Ofunato, Tohoku, Japan to deliver FREE HUGS and MESSAGES OF HOPE. 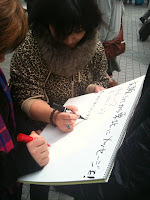 On May 9-12, 2011, the Ganbaranba Team went to Ofunato, Iwate to provide food and partitions for the shelters. I joined the group so that I could deliver my messages of hope and hugs that I gathered from Hiroshima, Kobe, Osaka, Nagoya, and Tokyo. Please visit the "Messages of Hope" page for more information and pictures. My name is Vincent Marx. I currently live in Japan as a writer and teacher. 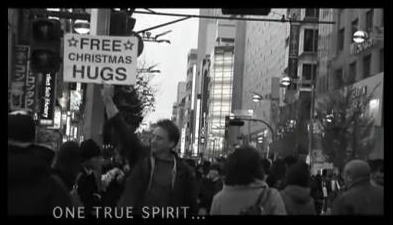 I started doing free hug events in December of 2010 after seeing a video by Juan Mann, the one who started the "Free Hug Campaign." I was inspired, and I stepped beyond my comfort zone. It has truly enhanced the way I perceive my life and the lives of others -- even as I walk through a crowded train station in Tokyo.